MOSCHUS was a Greek bucolic poet who flourished in Syracuse in the C2nd B.C. Only a small collection of his works survive, the largest being a poem entitled the Europa. Another poem, included here, called The Lament for Bion was formerly attributed to Moschus, but now is assigned to some unknown pupil of Bion's. The Greek Bucolic Poets. Translated by Edmonds, J M. Loeb Classical Library Volume 28. Cambridge, MA. Harvard Univserity Press. 1912. This Loeb volume is still in print and available new from Amazon.com (click on image right for details). 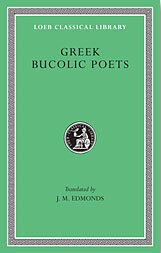 In addition to Moschus, the book contains the Idylls of Theocritus, poems of Bion, a pair of anonymous works (Megara and Dead Adonis), various pattern-poems (by Simas, Theocritus, Dosiadas, and Vestinus), as well as source Greek texts, Edmond's introduction and footnotes and an index of proper names. Cypris has lost her boy Love, and cries him in the streets. Cypris one day made hue and cry after her son Love (Eros) and said: “Whosoever hath seen one Love loitering at the street-corners, know that he is my runaway, and any that shall bring me word of him shall have a reward; and the reward shall be the kiss of Cypris; and if he bring her runaway with him the kiss shall not be all. He is a notable lad; he shall be known among twenty: complexion not white but rather like to fire; eyes keen and beamy; of an ill disposition but fair spoken, for he means not what he says – ‘tis voice of honey, heart of gall; forward, cozening, a ne’er-say-troth; a wily brat; makes cruel play. His hair is plenty, his forehead bold; his baby hands tiny but can shoot a long way, aye, e’en across Acheron into the dominions of Death (Hades). All naked his body, but well covered his mind. He’s winged like a bird and flies from one to another, women as well as men, and alights upon their hearts. He hath a very little bow and upon it an arrow; ‘tis but a small arrow but carries even to the sky. And at his back is a little golden quiver, but in it lie the keen shafts with which he ofttimes woundeth e’en me. And cruel though all this equipage be, he hath something crueler far, his torch; ‘tis a little light, but can set the very Sun afire. Let any that shall take him bind and bring him and never pity. If he see him weeping, let him have a care lest he be deceived; if laughing, let him still hale him along; but if making to kiss him, let him flee him, for his kiss is an ill kiss and his lips poison; and if he say ‘Here, take these things, you are welcome to all my armour,’ then let him not touch those mischievous gifts, for they are all dipped in fire. Moschus tells in Epic verse how the virgin Europa, after dreaming of a struggle between the two continents for the possession of her, was carried off from among her companions by Zeus in the form of a bull, and borne across the sea from Tyre to Crete, there to become his bride. The earlier half of the poem contains a description of Europa’s flower-basket. It bears three pictures in inlaid metal – Io crossing the sea to Egypt in the shape of a heifer, Zeus restoring her there by a touch to human form, and the birth of the peacock from the blood of Argus slain. So speaking she up and sought the companions that were of like age with her, born the same year and of high degree, the maidens she delighted in and was wont to play with, whether there were dancing afoot or the washing of a bright fair body at the outpourings of the water-brooks, or the cropping of odorous lily-flowers in the mead. Forthwith were they before her sight, bound flower-baskets in hand for the longshore meadows, there to foregather as was their wont and take their pleasure with the springing roses and the sound of the waves. Now Europa’s basket was of gold, an admirable thing, a great marvel and a great work of Hephaestus, given of him unto Libya the day the Earth-Shaker took her to his bed, and given of Libya unto the fair beauteous Telephassa because she was one of her own blood; and so the virgin Europa came to possess the renownèd gift, being Telephassa was her mother. And in this basket were wrought many shining pieces of cunning work. Therein first was wrought the daughter of Inachus,1 in the guise of a heifer yet, passing wide over the briny ways by labour of her feet like one swimming; and the sea was wrought of blue lacquer; and high on either cliff-brow2 stood a great crowd and watched the sea-going heifer. Therein for the second piece was the Son of Cronus gently touching the same heifer of Inachus beside the seven-streamèd Nile, and so transfiguring the hornèd creature to a woman again; and the flowing Nile was of silver wrought, and the heifer of brass, and the great Zeus of gold. And beneath the rim of the rounded basket was Hermes fashioned, and beside him lay outstretched that Argus which surpassed all others in ever-waking eyes; and from the purple blood of him came a bird uprising in the pride of the flowery hues of his plumage, and unfolding his tail like the sails of a speeding ship till all the lip of the golden basket was covered with the same. Such was this basket of the fair beauteous Europa’s. Now when these damsels were got to the blossomy meads, they waxed merry one over this flower, another over that. This would have the odorous narcissus, that the corn-flag; here ‘twas the violet, there the thyme: for right many were the flowerets of the lusty springtime budded and bloomed upon that ground. Then all the band fell a-plucking the spicy tresses of the yellow saffron, to see who could pluck the most; only their queen in the midst of them culled the glory and delight of the red red rose, and was pre-eminent among them even as the Child o’ the Foam among the Graces. Howbeit not for long was she to take her pleasure with the flowers, nor yet to keep her maiden girdle undefiled. For, mark you, no sooner did the Son of Cronus espy her, than his heart was troubled and brought low of a sudden shaft of the Cyprian, that is the only vanquisher of Zeus. Willing at once to escape the jealous Hera’s wrath and beguile the maiden’s gentle heart, he put off the god and put on the bull, not such as feedeth in the stall, nor yet such as cleaveth the furrow with his train of the bended plough, neither one that draweth in harness the laden wagon. Nay, but all his body was of a yellow hue, save that a ring of gleaming white shined in the midst of his forehead and the eyes beneath it were grey and made lightnings of desire; and the horns of his head rose equal one against the other even as if one should cleave in two rounded cantles the rim of the hornèd moon. So came he into that meadow without affraying those maidens; and they were straightway taken with a desire to come near and touch the lovely ox, whose divine fragrance came so far and outdid even the delightsome odour of that breathing meadow. There went he then and stood afore the spotless may Europa, and for to cast his spell upon her began to lick her pretty neck. Whereat she fell to touching and toying, and did wipe gently away the foam that was thick upon his mouth, till at last there went a kiss from a maid unto a bull. Then he lowed, and so moving-softly you would deem it was the sweet cry of the flute of Mygdony,3 and kneeling at Europa’s feet, turned about his head and beckoned her with a look to his great wide back. At that she up and spake among those pretty curly-pates saying “Come away, dear my fellows and my feres; let’s ride for a merry sport upon this bull. For sure he looks and mild, so kind and so gentle, nothing resembling other bulls; moreover an understanding moveth over him meet as a man’s, and all he lacks is speech.” So saying, she sat her down smiling upon his back; and the rest would have sate them likewise, but suddenly the bull, possessed of his desire, leapt up and made hot-foot for the sea. Then did the rapt Europa turn her about and stretch forth her hands and call upon her dear companions; but nay, they might not come at her, and the sea-shore reached, ‘twas till forward, forward till he was faring over the wide waves with hooves as unharmed of the water4 as the finds of any dolphin. And lo! the sea waxed calm, the sea-beasts frolicked afore great Zeus, the dolphins made joyful ups and tumblings over the surge, and the Nereids rose from the brine and mounting the sea-beasts rode all a-row. And before them all that great rumbling sea-lord the Earth-Shaker played pilot of the briny pathway to that his brother, and the Tritons gathering about him took their long taper shells and sounded the marriage-music like some clarioners of the main. Meanwhile Europa, seated on the back of Zeus the Bull, held with one hand to his great horn and caught up with the other the long purple fold of her robe, lest trailing it should be wet in the untold waters of the hoar brine; and the robe went bosoming deep at the shoulder like the sail of a ship, and made that fair burden light indeed. So spake he, and lo! what he spake was done; for appear it did, the Cretan country, and Zeus took on once more his own proper shape, and upon a bed made him of the Seasons unloosed her maiden girdle. And so it was that she that before was a virgin became straightway the bride of Zeus, and thereafter straightway too a mother of children unto the Son of Cronus. 1. "daughter of Inachus" : Io. 2. "either cliff brow" : Greece and Egypt (Gow). 3. "Mygdony" : Phrygia, whence the flute was supposed to have come with the worship of Dionysus. 4. "unharmed of the water" : the salt water was supposed to rot the hoofs of oxen. This poem seems to have been suggested by Bion’s own Lament for Adonis; in form it closely resembles the Song of Thyrsis. The writer was a pupil of Bion, and hailed from Southern Italy, but is otherwise unknown. Cry me waly upon him, you glades of the woods, and waly, sweet Dorian water; you rivers, weep I pray you for the lovely and delightful Bion. Lament you now, good orchards; gentle groves, make you your moan; be your breathing clusters, ye flowers, dishevelled for grief. Pray roses, now be your redness sorrow, and yours sorrow, windflowers; speak now thy writing, dear flower-de-luce,1 loud let thy blossoms babble ay; the beautiful musician is dead. A song of woe, of woe, Sicilian Muses. You nightingales that complain in the thick leafage, tell to Arethusa’s fountain of Sicily that neatherd Bion is dead, and with him dead is music, and gone with him likewise the Dorian poesy. He that was lovely and pleasant unto the herds carols now no more, sits now no more and sings ‘neath the desert oaks; but singeth in the house of Pluteus the song of Lethè, the song of oblivion. And so the hills are dumb, and the cows that wander with the bulls wail, and will none of their pasture. Your sudden end, sweet Bion, was matter of weeping even unto Apollo; the Satyrs5 did lament you, and every Priapus made you his moan in sable garb. Not a Pan but cried woe for your music, not a Nymph o’ the spring made her complaint of it in the wood; and all the waters became as tears. Echo, too, she mourns among the rocks that she is silent and can imitate your lips no more. For sorrow that you are lost the trees have cast their fruit on the ground, and all the flowers are withered away. The flocks have given none of their good milk, and the hives none of their honey; for the honey is perished in the comb for grief, seeing the honey of bees is no longer to be gathered now that honey of yours is done away. Never so woeful was the lament of the Siren6 upon the beach, never so woeful the song of that Nightingale7 among the rocks, or the dirge of that Swallow amid the long hills, neither the wail of Ceÿx for the woes of that Halcyon, nor yet the Ceryl’s song among the blue waves, nay, not so woeful the hovering bird of Memnon8 over the tomb of the Son of the Morning in the dells of the Morning, as when they mourned for Bion dead. O thrice belovèd man! who will make music upon thy pipe? Who so bold as to set lip to thy reeds? For thy lips and thy breath live yet, and in those straws the sound of they song is quick. Shall I take and give the pipe to Pan? Nay, mayhap even he will fear to put lip to it lest he come off second to thee. There’s Galatea,9 too, weeps for your music, the music that was erst her delight sitting beside you upon the strand. For Cyclops’ music was all another thing; she shunned him, the pretty Galatea, but she looked upon you more gladly than upon the sea. And lo! now the waves are forgotten while she sits upon the lone lone sands, but your cows she tends for you still. O tunefullest of rivers, this makes thee a second grief, this, good Meles,11 comes thee a new woe. One melodious mouthpiece of Calliopè is long dead, and that is Homer; that lovely son of thine was mourned, ‘tis said, of thy tearful flood, and all the sea was filled with the voice of thy lamentation: and lo! now thou weepest for another son, and a new sorrow melteth thee away. Both were beloved of a water-spring, for the one drank at Pegasus’ fountain and the other got him drink of Arethusa; and the one sang of the lovely daughter of Tyndareüs, and other great son of Thetis, and of Atreid Menelaüs; but this other’s singing was neither of wars nor tears but of Pan; as a herdsman he chanted, and kept his cattle with a song; he both fashioned the pipes and milked the gentle kine; he taught the lore of kisses, he made a fosterling of Love, he roused and stirred the passion of Aphrodite. O Bion! There’s not a city, nay, not a humble town but laments thee. Ascra makes far louder moan than for her Hesiod, the woods of Boeotia long not so for their Pindar; not so sore did lovely Lesbos weep for Alcaeus, nor Teos town for the poet12 that was hers; Paros yearns as she yearned not for Archilochus, and Mitylenè bewails thy song evermore instead of Sappho’s. To Syracuse thou art a Theocritus, and as for Ausonia’s mourning, ‘tis the song I sing thee now; and ‘tis no stranger to the pastoral poesy that sings it, neither, but an inheritor of that Dorian minstrelsy which came of they teaching and was my portion when thou leftist others thy wealth but me thy song. Ay me! when the mallows and the fresh green parsley and the springing crumbled dill perish in the garden, they live yet again and grow another year; but we men that are so tall and strong and wise, soon as ever we be dead, unhearing there in a hole of the earth sleep we both sound and long a sleep that is without end or waking. And so it shall be that thou wilt lie in the earth beneath a covering of silence, albeit the little croaking frog o’ the tree by ordinance of the Nymphs may sing for evermore. But they are welcome to his music for me; it is but poor music he makes. There came poison, sweet Bion, to thy mouth, and poison thou didst eat – O how could it approach such lips as those and not turn to sweetness? And what mortal man so barbarous and wild as to mix it for thee or give it thee at thy call? – and Song went cold and still. Howbeit Justice overtaketh every man; and as for me, this song shall be my weeping sad lamentation for thy decease. Could I but have gone down into Tartarus as Orpheus went and Odysseus of yore and Alcides long ago, then would I also have come mayhap to the house of Pluteus, that I might see thee, and if so be thou singest to Pluteus, hear what that thou singest may be. But all the same, I pray thee, chant some song of Sicily, some sweet melodious country-song, unto the Maid13; for she too is of Sicily, she too once sported on Etna’s shores; she knows the Dorian music; so thy melodies shall not go without reward. Even as once she granted Orpheus his Eurydicè’s return because he harped so sweetly, so likewise she shall give my Bion back unto the hills; and had but this my pipe the power of that his harp, I had played for this in the house of Pluteus myself. 1. "flower-de-luce" : the petals of the iris were said to bear the letters AI, "alas." 2. "Strymon" : a river of Thrace, where Orpheus lived and died; swans were said to sing before their death. 3. "Oegrian damsels" : daughters of Oeagrus king of Thrace and sisters of Orpheus. 5. "Pan, Priapus, Satyrs, Nymphs" : the effigies of these deities which stood in the pastures. 6. "the Sirens" : these were represented as half-bird, half woman, and bewailed the dead. 7. lines 38-41 : The references are to birds who once had human shape. 8. "bird of Memnon" : The tomb of Memnon, son of Dawn and Tithonus, was visited every year by birds called Memnonidae. 9. "Galatea" : Bion seems to have written a first-person pastoral resembling Serenade, in which the neatherd lover of Galatea say to her on the beach. If so, Fragment XII would seem to belong to it. 10. "the other day" : The reference to Adonis' death is doubtless to recent Adonis-Festival. 11. "Meles" : the river of Smyrna, birthplace of Bion and claiming to be the birthplace of Homer. 12. "the poet that was hers" : Anacreon. 13. "the Maid" : Persephonè, who was carried off by Pluto – here called Pluteus – when she was playing in the fields of Sicily. Of the remaining poems the first three are quoted by Stobaeus. The last is found in the Anthology (Anth. Plan., 4.200), and was wrongly ascribed to Moschus owing to its mention of Europa's bull. When the wind strikes gently upon a sea that is blue, this craven heart is roused within me, and my love of the land yields to the desire of the great waters. But when the deep waxes grey and loud, and the sea begins to swell and to foam and the waves run long and wild, then look I unto the shore and its trees and depart from the brine, then welcome is the land to me and pleasant the shady greenwood, where, be the wind never so high, the pine-tree sings her song. O ‘tis ill to be a fisher with a ship for his house and the sea for his labour and the fishes for his slippery prey. Rather is it sleep beneath the leafy plane for me, and the sound hard by of a bubbling spring such as delights and not disturbs the rustic ear. Pan loved his neighbour Echo; Echo loved a frisking Satyr; and Satyr, he was head over ears for Lydè. As Echo was Pan’s flame, so was Satyr Echo’s, and Lydè master Satyr’s. ‘Twas Love reciprocal; for by just course, even as each of those hearts did scorn its lover, so was it also scorned being such a lover itself. To all such as be heart-whole be this lesson read: If you would be loved where you be loving, then love them that love you. When Alpheüs leaves Pisa behind him and travels by the sea, he brings Arethusa the water that makes the wild olives grow; and with a bride-gift coming, of pretty leaves and pretty flowers and sacred dust,1 he goeth deep into the waves and runneth his source beneath the sea, and so runneth that he two waters mingle not and the sea never knows of the river’s passing through. So is it that he spell of that impish setter of nets, that sly and crafty teacher of troubles, Love, hath e’en taught a river how to dive. 1. “sacred dust” : the dust of the race-course at Olympia (Pisa).